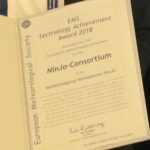 Technological contributions associated with instrumentation and methodologies used in meteorology and related sciences and their applications that have the potential for Europe-wide impact are recognised with the EMS Technology Achievement Award. The deadline for nominations is 31 January 2019, 12:00 CET. (1) until 10 December 2018: submission of a summary (max. 1 page) – feedback from the committee is given at the lastest by 7 January 2019. This stage is optional and no pre-requisite for the submission of a full nomination. (2) until 31 January 2019, 12:00 CET: The full proposal has to be submitted by this date. EMS Member Societies and EMS Associate Members and their respective members or staff are eligible to make nominations for the EMS Technology Achievement Award.